Frequently asked questions about the water emergency. The City of Rialto has amended its water conservation ordinance and declared a Stage 3-B water emergency. Under the updated rules, which took effect in early August, individuals or companies not complying with emergency water restrictions will receive two written warnings. If violations continue to be observed after two written warnings, fines will be issued. For a third violation, a customer will receive $100 fine. For a fourth violation, a fine of $300 will be imposed and a flow-restricted device will be placed on a customer’s water meter. For a fifth violation, customers will receive a $500 fine and potentially the loss of water service for two days. There are a variety of steps you can take TODAY to reduce your water use or be more efficient with this precious resource. You can start with checking for leaks in your system. Are your sprinklers running too long? Do you need to convert to a drip irrigation system? Is your toilet leaking? Fixing problems now can save hundreds of gallons of water a day. For more conservation tips and other drought-related information, please visit www.iefficient.com. iEfficient is a collaborative conservation effort developed by water agencies and cities throughout the Inland Empire. Recognizing the need to change the way local families and businesses think about and use water, we have united to help end water waste in the Inland Empire. The City of Rialto is a proud support of this important initiative. 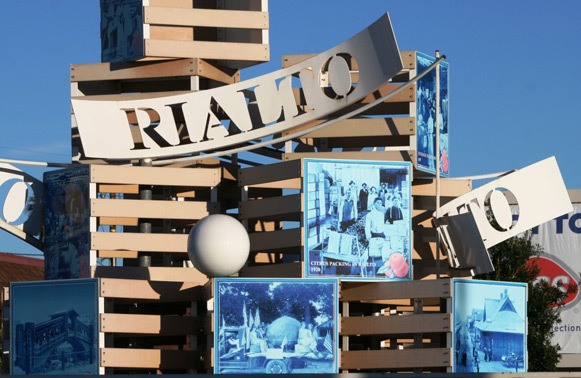 In 2012, the City of Rialto agreed to a 30-year concession agreement to accelerate delivery of much-needed capital improvement projects and turn over management the water systems to Veolia North America.